I brought home our first bouquet of tulips for the season. Yeah!...we love them too!...but it is snowing here! one of my favs! beautiful picture! stunny photo trina or mike, whichever! happy st. pattys day. How I love the first blossoms of Spring! Beautiful! It is in the 80s here today, and everything is coming to life! These made my day - the pink is so beautiful. Last week, I brought home our first bouquet of the spring season - bright yellow tulips! Georgous. they are my favorite flower. How beautiful Trina!! I adore tulips. Happy Weekend to you and your family! Your home is truly a inspiration not only your home but your way of living simple. My husband brought home a bouquet of them about 5 weeks ago. I love tulips! You always have such cheerful pics. I love it. Thank you. What could be more lovely than pink tulips? Absolutely gorgeous!! Both the flowers and the photo!! 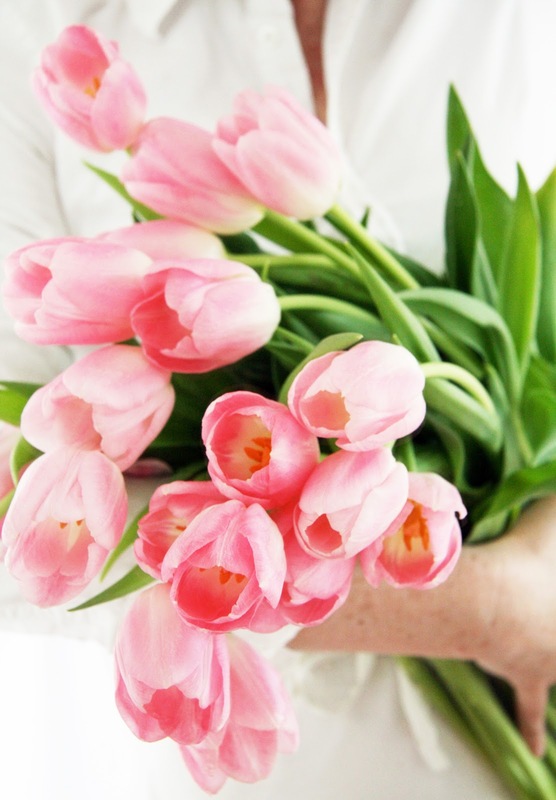 Pink tulips and a photo from you speaks spring to me like no other . . . LOVELY . . .
Beautiful photo! Have always loved tulips. So gorgeous... I saw oodles of them at the Pike Place Market yesterday, I'm not wishing I'd bought some daffodils and tulips... just didn't spend the money. Beautiful tulips and beautiful photograph! Love those pink tulips! All the Spring bulbs are coming up around here. Everything is blooming so beautifully! Blessings! It turned out to be a rather nice weekend, thank you very much. I hope you had a lovely weekend too. Beautiful, happy Spring to you. So lovely. You might consider planting tulip bulbs yourself this autumn; well worth the effort and so easy to do! My favorite flowers! Welcome to spring! 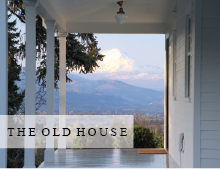 I'm a new follower...love your blog and your home is lovely. Just curious, what camera do you use? The light is just so amazing. I use a Canon Rebel xsi. I also use Photoshop elements. I took this photo using our dining room mirror so it's actually a reflection of me holding the tulips!